The boy was astounded. "You mean your brother gave it to you and it didn't cost you nothing? Boy, I wish...." He hesitated. Of course Paul knew what he was going to wish for. He was going to wish that he had a brother like that. But, what the lad said jarred Paul all the way down to his heels. Paul smiled a little. He thought he knew what the lad wanted. He wanted to show his neighbors that he could ride home in a big automobile. But, Paul was wrong again. "Will you stop where those two steps are?" the boy asked. He ran up the steps. Then in a little while Paul heard him coming back, but he was not coming fast. He was carrying his little crippled brother. He sat him down on the bottom step, then sort of squeezed up against him and pointed at the car. "There she is Buddy, just like I told you upstairs. His brother gave it to him for Christmas. This is what I've been trying to tell you about." Paul got out and lifted the younger lad into the front seat of his car. The shining-eyed older brother climbed in beside him, and the three of them began a memorable holiday ride. 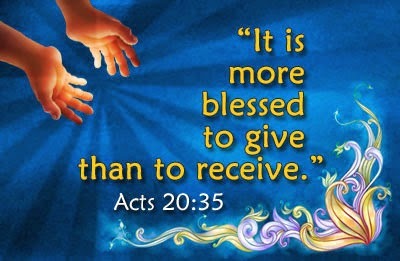 That Christmas Eve, Paul learned what Jesus meant when he said: "It is more blessed to give...."